At one time, four churches were located at the intersection of Central and Common Streets. In the 1900's local residents congregated on Sunday afternoons in this area to socialize at community functions. The First Universalist Church was built in 1840 and looked much like the Congregational Church. 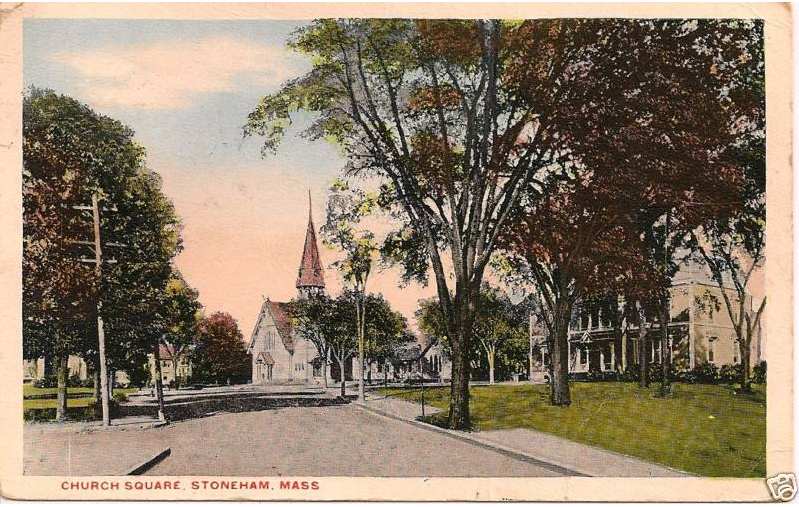 That building was replaced by the current structure in 1870 that is now home to Stoneham TV. It previously had a very beautiful steeple that had to be taken down in the 1980s due to damage. The original Methodist Church burned in 1909 and was replaced by the building you see today. Its predecessor, built in 1856, was on Common Street and faced the Congregational Church, and also featured a lovely steeple. After 1826 the town was not responsible for the financial support of the second Meeting House / church that was located at Pleasant Street. 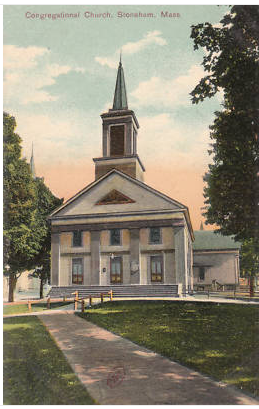 A parish was organized and the Congregational Church became independent of the town. That second church building burned in January of 1840. Like the Town House that had been moved seven years before, the goal was to build a new church closer to the Medford-Andover Turnpike and the new town center. The cost to build this church was just under $6,500. When the Congregational Church was built, it brought a flurry of activity with other churches becoming organized and erecting buildings nearby. The last church in “Church Square” was the former Baptist Chapel, built and dedicated in 1871 on Common Street. The building is now the property of the American Legion Hall. In 1892, the new First Baptist Church was dedicated at the corner of Main and Hancock Streets.